Music curation seems to be a hot space right now. 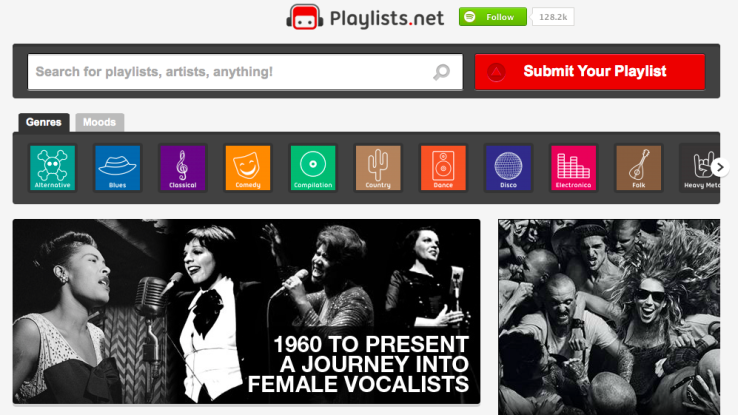 We’re hearing Spotify community and playlist sharing site, Playlists.net, could be the next music curation start-up to be acquired. According to industry sources, the UK start-up is in talks with a number of “prominent music industry companies,” with one potential suitor currently in the lead, though we've been unable to confirm who that is. One source goes as far as to say that there are, or were at one time, “a number of separate terms sheets on the table,” which span tech companies as well as, notably, record companies. I wouldn't be surprised to see something happen as soon as the next few weeks. Launched in 2009, the then-named ShareMyPlaylists was one of the first start-ups to jump head-first into the Spotify ecosystem (and before it was clear Spotify could sustain an ecosystem), providing users with a place to upload and share playlists. Then, once the service had amassed enough content to scale, it flicked the music discovery switch, including launching a playlist generator powered by EchoNest and iOS, Android and Spotify apps that emphasised consuming music curated by its core users. Thousands of curated playlists uploaded and listened to give you all sorts of interesting data to plug into, and, after releasing an API in early 2013, Playlists.net let developers do just that. It also added the ability to find playlists by “mood,” pitting it against Songza more directly. To give you an idea of how that strategy has panned out, the startup currently claims 1 million users per month, amounting to 4.5 million “listening sessions” per month, and 1 billion Spotify streams per year. Depending on which way you slice it, that’s a not-insignificant dent in the music curation space, especially for a rather moderately funded company. To date, Playlists.net has raised just £600,000. But, metrics aside, why might Playlists.net make a potential acquisition target for either a technology company operating in the music space or, indeed, a major record label? In many ways, music streaming services are already entering commodity territory, especially now that Google, Amazon and Apple are getting in on the act. Just last week, Google boughtmusic streaming service Songza, which offers up human curated playlists based on your mood, tastes and other contextual data. Meanwhile, a little over a month ago, Appleacquired Beats for $3 billion. In addition to selling rather expensive headphones, Beats operates a music-streaming service that focuses on human curation — rather than leaving recommendations purely to an algorithm — as a way of differentiating itself from competitors. However, as Google’s acquisition of Songza shows — or so the theory goes – it’s no longer enough to simply launch a streaming music service. “You need curation to make sense of it,” says one source, citing the poor quality of Amazon’s playlists. In addition, Playlists.net has always trumpeted the fact its playlists are curated by thousands, if not millions of users, rather than the more elitist approach taken by other curation services. Whether or not this produces better curation, however, is open to debate. Record labels, on the other hand, aren’t directly in the business of operating a music streaming service, even if they are now heavily reliant on them — especially as streaming music now counts towards the official charts in the UK as of this week. With Playlists.net thought to have compiled the biggest database of independent Spotify playlists, there’s a potential opportunity for a major record label to leverage the platform to ensure playlists featuring their acts are more prominently promoted, or that acts they’ve signed feature on the most popular playlists. Finally, there’s another curious aspect at play here, with regards to a potential Playlists.net exit. One of the company’s backers, Mark Pearson, has recently seen a number of exits of his own, most notably Markco Media, owner of MyVoucherCodes and Last Second Tickets, whichsold to Monetise for up to £55 million last week. It’s my understanding Pearson has also seen another investment, HushHush, pick up a buyer, though he isn’t saying who, and so it could be that Playlists.net is next as Pearson looks to clear more space in his portfolio for whatever he has planned in the future.